Art = Life at R.L. Delight Fine Art: Improvements! Before I get started on this week's drawing, I wish to thank all of you for reading and leaving such encouraging comments! They are appreciated. I hope to be catching up on my blog reading soon as things are gradually getting unpacked and put away here at home. This is another full tonal charcoal drawing that was worked in eight 3 hour sessions for a total of twenty four hours. The last six hours flew by as we were trying to get the drawings as finished as possible. This one went a lot smoother for me, much to the master teacher's approval. I can feel that working with the charcoal is a lot easier than the previous drawings. Little by little the skills improve. That is not to say that I don't see every error and weakness though. I do see the improvements and the strengths but my fingers itch to pick up a stick of charcoal and smooth a tone here and define a plane there. 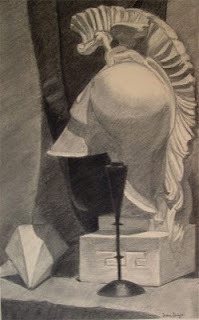 For this study, I was sitting to the far right side so my view is somewhat from behind the cast statue of the helmet, and, yes the crest on the helmet made me cross-eyed while drawing it. I would do a small clump of three shapes then work on another area and then come back. It got done little by little over the course of the drawing. The little creature at the top which sort of looks like Pegasus really does look that odd in person. I enjoyed working on this one tremendously. I am not sure why. It could be because I liked the dramatic composition or because it went relatively smooth for me. I suspect the latter had more to do with it. We shall see with the next composition starting Tuesday. It is always interesting at the start of a new drawing. I look at the still life and then at the blank paper and think, "Really?" "That is supposed to end up here?" Yet, they train us to know how to start and proceed so we do and eventually, it does end up on your paper! I still find that rather amazing. The edges on this picture are a bit more cropped than the actual drawing but the crest does come pretty close to the edge of the drawing, just not as close as the picture looks. Construction drawing went a lot better this week too. I had a hand to draw and finally actually got to the construction part. I will post it next week as I suspect that we are in for another long drawing this coming week. In between school and unpacking I will try to get a bit of Olympic viewing in. I can't tell you how disappointed I am to not be able to watch the Olympics on the Canadian TV stations. The Canadian coverage has always been superior to the American coverage in my view and this year with them being on the West Coast it would have been even better. We are in the same time zone yet NBC delays the coverage, twice. The American coverage ends long after the actual events have taken place. Ah well, I could rant about this for a few more paragraphs. I will enjoy what I can. We have often been to Whistler in the summertime so it is fun to see all the familiar places. Hello to all our Canadian friends and great job on the Olympics. Wow - huge improvement!!! I did a doubletake when I opened this post. Great job!! That looks super hard to draw too. PS: I know what you mean about being behind on blogs!!! Thanks Sue! I am heading over to my blog reader to catch up. Of course it's early and dark and muddy so instead I'll just enjoy how lovely the drawing is. Don't get me started on the Olympic coverage. I hoped it might be better since it was in a US time zone, but of course not. Still not worse than the last summer games but dang close. Hi Theresa, I was fortunate last Olympics to be living close enough to the Canadian border to watch them on the Canadian station. NBC could learn a lot from CBC! I would much rather watch the games then watch some news anchor ride a snow mobile. Ah, I could rant some more myself! Beautiful drawing Renee! And total agreement about the delay and blah blah blah of American Olympic coverage. Don't you feel proud seeing the Pacific Northwest shown this way to the world though? Thanks Dana! Yes, it does do us proud but it sure makes me miss it.